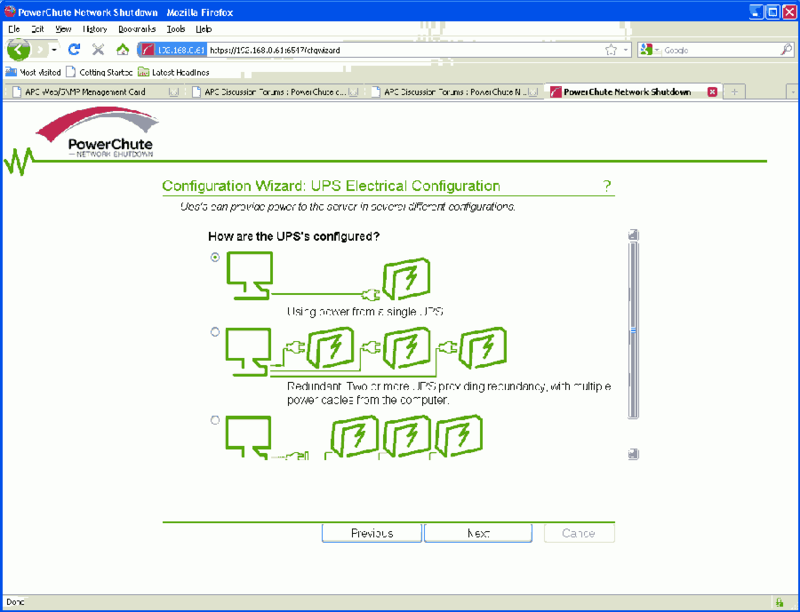 on Setting up a UPS solution, to enable clean shutdown of vital network components. This post is about setting up the software that will be responsible for cleanly shutting down servers and workstations. We have to decide which machine/s is/are going to be used to launch our script (which in turn is run by what APC call a command file). Currently I’ve got an old laptop I pulled out of the rubbish about 5 years ago, with Windows XP running on it. It’s got just enough battery capacity to stay alive for long enough to receive the event from the NMC (Network Management Card) and run my .dll that issues the shutdown sequence. A couple of EeePC 901’s have also recently been made redundant, and I may use one of those with Windows 7 installed at some stage. Currently all of my workstations and servers that don’t have batteries, I.E. notebooks are VM’s running on ESXi. Oh… or servers that have their entire file system loaded into volatile memory, so if they are powered off, I.E. cold shutdown, there is no possible corruption of the file system. What you can also do is host the PCNS (PowerChute Network Shutdown) on a VM, because once the shutdown of ESXi has been initiated, there is no stopping the sequence, and the VM’s will all be cleanly shutdown. Or better still, use more than one machine to host PCNS, as they will operate on a first in first served basis. As you’ll see here the NMC’s firmware and PCNS are quite extensible. The above document is recommended reading if your planning on setting up an APC UPS and want to automate clean shutdowns. Without reading, the comms can get a little confusing. v2.2.4 linked to from here, which has additional documentation. v3.0.0 linked to from here, which has additional documentation. Both of which were linked to from here, which has additional manuals etc. The PCNS service needs to be run as a local Administrator as the default Local System account doesn’t have sufficient rights. In saying all that, William Tournas from APC recommended I use PCNS 2.2.1 for Windows XP. Additional 2.2.1 resources are found here. 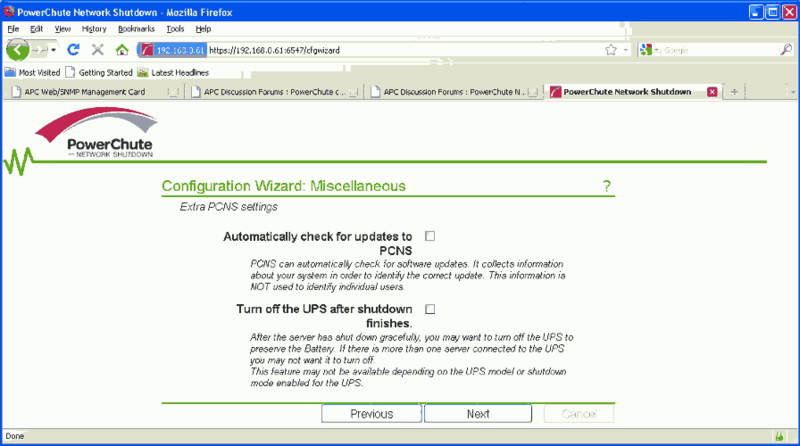 If using vMA with PCNS 3.0, you go through a Web UI configuration wizard once installed. 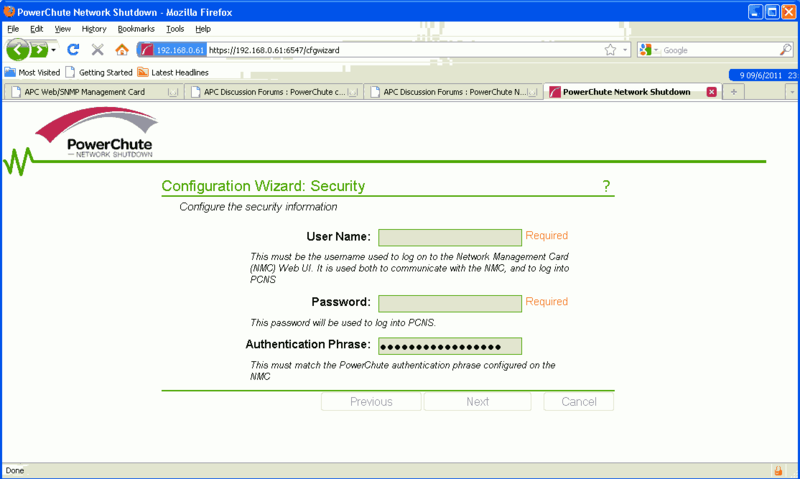 If using PCNS with Windows, the configuration is part of the install. If it’s not, you’ll need to open those ports on your firewall. 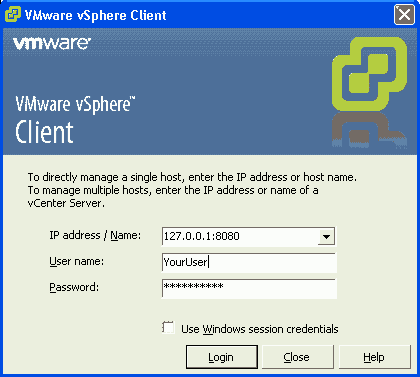 VMware provide vMA (vSphere Management Assistant) a CentOS VM image. You’ll have to have the same ports open, as PCNS will be listening on them. Once again, if these ports are not open, you’ll have to find which script is being used to set up the rules. This script would call a script that sets up the rules and one that tears them down. I’m going to be making a post about how I set up my firewall (iptables) rules for the netfilter module on our notebooks at some stage soon. If I haven’t already done this and you need more help, just sing out. ESXi.pdf linked to from here linked to from here. I think this also applies to PCNS 3.0 and ESXi 4.1 which I tried out. I read somewhere that the PCNS needs to have the same credentials as the NMC, so just be aware of this. I made a couple of posts there. 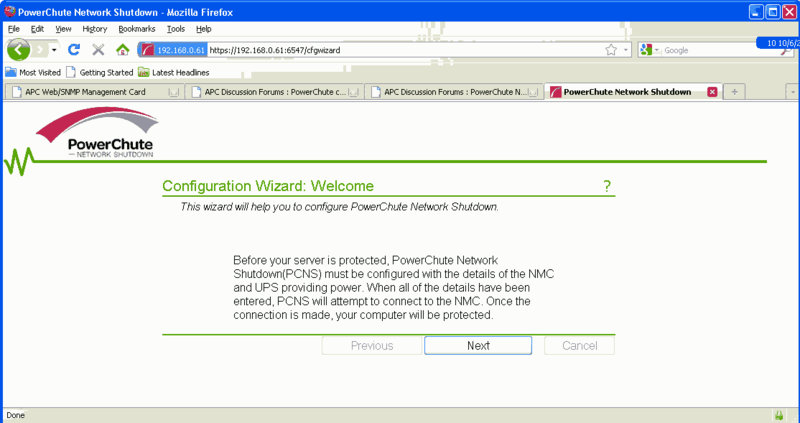 goes through a whole lot of issues and work-arounds with PowerChute. For example, discuss’s the correct way to run the command file, PowerOff.bat in our case. 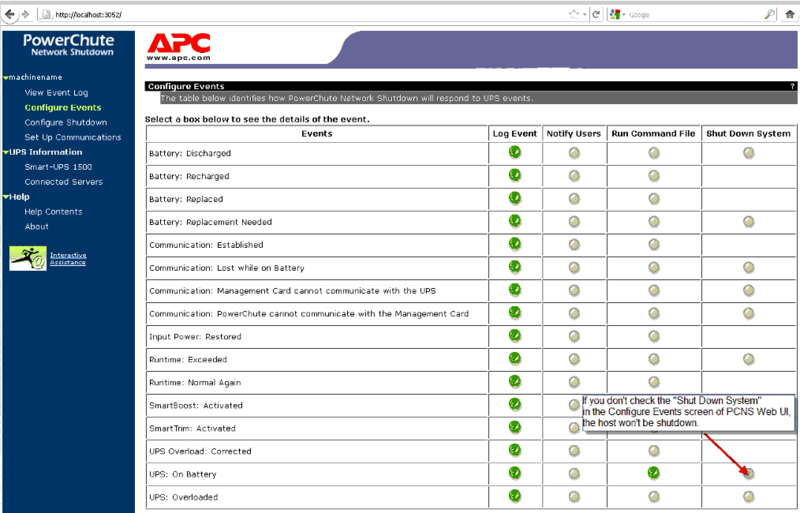 The APC PCNS receives an event from the AP9606 (that’s the NMC (Network Management Card)) fitted to the UPS. The script is launched by APC PCNS from a Windows or Linux box. I read that PCNS will always shutdown the windows machine it’s running on. PowerChute has an option to ‘run this command’ but it’s limited to 8.3 paths and won’t accept command line parameters. that runs the shutdown script with the parameters – but that could shut down other ESXi boxes as well if required. I was keen to use PowerShell to perform the shutdowns, as I’d read it was quite capable and also VMware supplied a large set of management cmdlets. If running PowerOffUPSGuests.ps1 from command shell rather than from a batch file. You need to add the PowerCLI snapin. 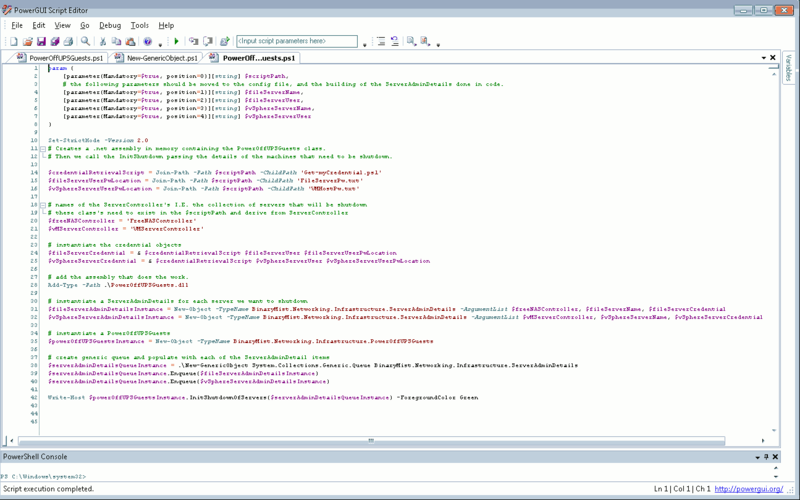 Following are the PowerShell scripts I used. First we had to create our password file to use to log in to vSphere. See this post for how this was done. REM VMware would have used the Export-Console cmdlet to export the name of the PowerShell snap-in PowerCLI uses. REM Invoke the command with the call operator (The ampersand). Write-Host "Waiting $seconds Seconds. " Write-Host "Waiting %seconds Seconds. " Write-Host "Putting $hostName into maintenance mode. " I had a hunch that it was due to the read only restriction I had heard about. So as it turned out, VMware has removed write access from PowerCLI to ESXi, in 4.0 onwards I think. that I would execute using PowerShell. First command needs to shutdown my fileserver. Used Burp suite to diagnose the http frames being sent received from/to vSphere client/ESXi. I haven’t used this tool before, but it gave very good visibility of the messages being sent/received. to point to 127.0.0.1:8080 This is where the Burp proxy listens on by default. In Burp, you will also need to add another proxy listener to the proxy->options tab. Check support invisible proxying for non-proxy-aware clients. The in-app help has good documentation on this. Set redirect to host to the ESXi host name. Select the generate CA-signed per-host certificates radio button. I also made sure the new proxy rule was the only one running. When Burp captures each frame, you can forward each one onto any one of the other tools in the suite. This is a really nice tool. My PowerOffUPSGuests.ps1 was about to significantly change too. so needed to Let PowerShell know about the .net 4 CLR. By default PS 2.0 is only aware of the .net 2.0 framework. This works for PowerShell, but not for PowerGUI (obviously) which I was using for debugging. So If you still need PowerGUI you’ll have to add the registry hacks explained in the links above. Remember to remove them once finished as they take affect system wide. I also had some trouble with later versions of C# than 2.0 when compiling on the fly in PowerShell. Although I was specifying the language. Found a workaround this bug here. We’ll go over the library code in the third part of this series. # add the assembly that does the work. I was unsure whether we were going to be able to get ESXi to cleanly shutdown it’s guest VM’s. As I’d had some trouble with this previously. I was thinking about writing a WCF service and client to shutdown windows guests for now. The service being on the machine that needed to be cleanly shutdown. Could use something like the following command line in the service. I was sure there was a better way though. ——try put host into maintenance mode, set timer. set it to something really small, so it runs the command file sooner. Set the time that’s required for the command file to complete to 5 minutes. Although I don’t think it matters that much, as long as there’s enough time to start the execution of the PowerShell script. Once the script is running, we don’t care how long PCNS thinks it should wait, as it’s non blocking. What is needed for ESXi to shut down all machines cleanly? Graceful shutdown work around for ESXi guests. Also it’s important to make sure the root user of ESXi has the Administrator Role. What is needed for Windows VM’s to shutdown cleanly? First ascertain whether or not your VM is/isn’t being shutdown cleanly. The scripts that may play a part in the shutting down of the Windows VM’s. You can see for the shutdown script, that it actually does nothing. I just created a shutdown.bat with the following in it. This cleared up any errors I was getting in my Windows7 logs. What is needed for Linux VM’s to shutdown cleanly? View the relevant log that contains shutdown info. My Debian wheezy server wasn’t getting shutdown cleanly. Had some trouble with the NZ repo for those packages, they were corrupt. So renamed /etc/apt/apt.conf so apt-get wasn’t using my cached packages from apt-cacher. The scripts that may play a part in the shutting down of the Linux VM’s. Mine didn’t appear to do much, but my server was being shutdown cleanly now. Shout out if anythings unclear. This entry was posted on July 26, 2011 at 20:29 and is filed under GNU/Linux, Microsoft, PowerShell, Projects, UPS, Virtualisation. You can follow any responses to this entry through the RSS 2.0 feed. You can leave a response, or trackback from your own site. This is a well done article that I have bookmarked for future reading. Have a great day. Everyone lovess what you guys tend to be up too. This kind of clever work and coverage!